After 15 days in space and two dockings with a prototype space station module, China's Shenzhou 10 spacecraft, carrying a veteran astronaut and two first-time fliers, fell back to Earth Tuesday (U.S. time), closing out the country's fifth manned spaceflight with an on-target landing. The re-entry was carried live on Chinese television, with infrared shots of the spacecraft's long re-entry plume as it streaked across the sky, followed by inflation of its main parachute as it descended toward the landing zone in the Siziwang Qi region of Inner Mongolia. With commander Nie Haisheng at the controls in the command module's center seat, flanked by Zhang Xiaoguang and Wang Yaping, China's second female astronaut, the Shenzhou 10 spacecraft settled to a jarring rocket-assisted touchdown around 8:07 p.m. EDT (GMT-4; 8:07 a.m. Wednesday local time). The spacecraft appeared to be dragged a short distance by its still-inflated parachute before coming to a rest on its side. Mission duration as 14 days 14 hours and 29 minutes. Recovery forces stationed nearby reached the capsule within a few minutes, opened its main hatch and carried out initial medical checks. About an hour and a half after landing, Nie and his crewmates were helped out of the descent module, smiling and waving to recovery crews. All three appeared healthy and in good spirits, accepting flowers and ceremonial scarves presented by a trio of colorfully dressed Mongolians. "This is my second time to fly into space and this is a great privilege and honor for me," Nie said, resting in a chair near the descent module. "I feel very good back at home and at this moment what I want to say most is that space is our dream, that ... I want to wish for a more prosperous future for our country and better life for our people. I would like to thank all the people in China for their support." Speaking from the Chinese mission control center, Zhang Gaoli, China's vice premier, congratulated "the astronauts and all the technicians, experts and families of the workers on the successful conclusion of this mission." Following past practice, Nie and his crewmates were expected to be flown to Beijing for more extensive medical exams, debriefings and reunions with friends and family. Shenzhou 10 was launched from the Jiuquan Satellite Launch Center atop a Long March-2F rocket on June 11. Nie, veteran of a 2005 Shenzhou flight, monitored an automated docking with the Tiangong 1 space station module two days later. Amid a full slate of science and technology development experiments, Wang delivered a space lecture broadcast to more than 60 million school kids. Last weekend, the crew undocked and Nie guided the Shenzhou 10 spacecraft to a manual linkup in another test of rendezvous procedures. Monday evening, the crew undocked a final time, carrying out yet another close approach and ground-commanded flyby before departing Tiangong 1 for good. The Shenzhou 10 mission "carries the space dream of the Chinese nation," President Xi Jinping told the crew before launch. "It will also show the Chinese passion to reach for the stars and reach into space. You have made all of us very proud." The Shenzhou 10 flight was the latest in a series of incremental steps laying the groundwork for assembly of a much larger Mir-class space station around the end of the decade. Building a large space station is the official goal of China's manned space program. During the mission, Xi called the crew again, telling them "the space dream is part of the dream to make China stronger. With the development of space programs, the Chinese people will take bigger strides to explore further into the space." "This is your time in space," he radioed, his words translated by Central China Television. "Have you gotten accustomed to the work and life there?" "President Xi, during the past 13 days in space, we've quickly become accustomed to zero gravity," Nie replied. "I feel good in all respects. We have made smooth progress on our space experiments. Right now, we all feel energetic and enthusiastic. We are committed to our space mission." Wang told Xi the crew enjoyed a "normal" diet and "we can all rest seven to eight hours each day." "I also served as a teacher in space, demonstrating to youngsters across China physical phenomena in the zero-gravity environment," she said. "For me, it's an opportunity to learn and improve." Xi told the crew the space lecture was carried live to more than 60 million students in some 80,000 schools across the nation. "It was of great significance," he said. "It helps them develop an interest in science and space exploration. We hope you focus on your work, closely cooperate with each other and complete the rest of your work. We all look forward to your triumphant return." China became the third nation, after the United States and the Soviet Union/Russia, to launch a manned spacecraft in October 2003 when Yang Liwei blasted off aboard the Shenzhou 5 spacecraft. 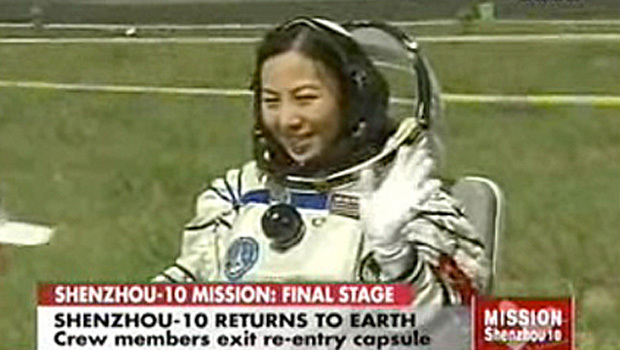 China followed that flight by launching two men and a woman on the Shenzhou 9 mission in June 2012. They carried out the program's first manned rendezvous and docking. Joan Johnson-Freese, an expert on China's space program, told CBS News the latest mission was aimed at gathering the experience needed to build the larger space station planned later this decade. "After this, they supposedly will move on to Tiangong 2, which will allow them to keep a crew of three in orbit for 20 days," she said before launch. "It's all building to part three, which is the space station they will launch when they have the capability to launch it on the Long March 5 (rocket)."